In both rural and urban environments, dangers abound, and it pays to be prepared. It isn’t enough to simply own a firearm and know how to use it, using the best possible gun holster is just as crucial. Concealment, position, comfort, size, compatibility with your gun, easy draw, durability, and price are all factors to be considered. Some conceal carry holsters work well for men and women alike, but there are also models designed for women only. Below, we introduce five of the top choices of discreet gun holsters for women. Waistline gun holsters for women are easy to use and conceal and are easily the most popular choice. 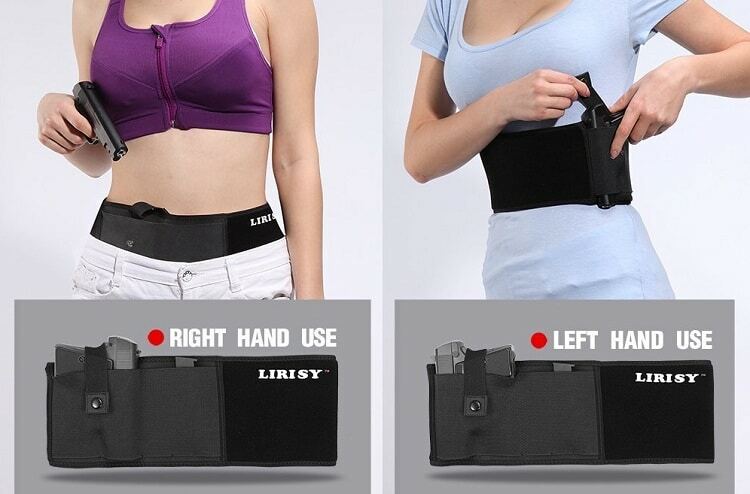 Lirisy offers a strong, Neoprene belly band holster that gives you good comfort and functionality for an affordable price. This holster is made for hand guns only. The belt can be easily rotated to accommodate left or right handed wearers. It fits snug and secure, and the gun comes out smooth and quiet on the draw. The biggest benefit of this particular holster is its soft, lightweight Neoprene material. It minimizes discomfort when worn direct to the skin, and the ventilation holes help cut down on sweat getting trapped below the belt. Thus, you can wear this holster for long periods of time in good comfort. There is also a carrying pouch where you could store an extra magazine, a cell phone, cash, a knife, or a host of other possibilities. The only drawbacks are that the strap is only three inches wide and that it would be a bit uncomfortable if worn on a bike or motorcycle. The price tag is around $20. 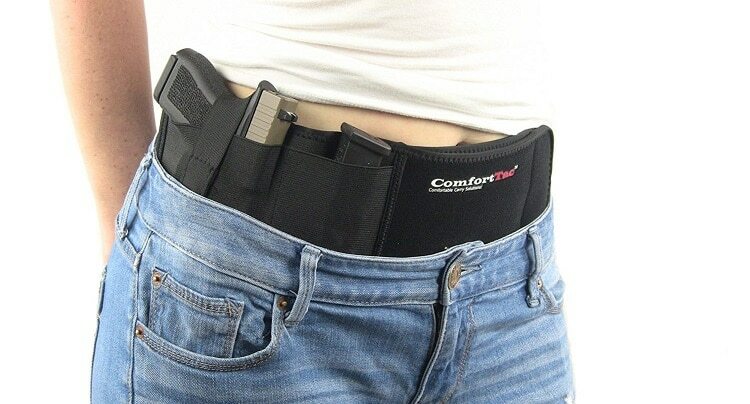 This waistline holster put out by ComfortTac is a little more pricey than the last reviewed holster, but, as the name indicates, it’s worth it because it’s the “ultimate.” The material is, again, Neoprene, which gives you great comfort and aeration. It is soft on the skin and easily stretches to accommodate a wide range of sizes. The holster can be worn over clothes or direct to skin. It works well with the full range of pistols and revolvers. You can adjust it with ease for left or right hand draw. There is a special compartment for an extra magazine or in which to store other valuables. You can optionally use a retention strap for added support. Draw will be faster without the retention strap, so you have to choose between quicker draw and added support. But either way, both factors are quite adequately taken care of. The clasp covering the gun is rigid for extra protection, and it uses a clip instead of Velcro, which makes release quieter. It will take some getting used to to wear this holster. Nonetheless, once acclimated, you will find that it gives you good comfort and superior quality while keeping everything nicely concealed. The cost is around $40. 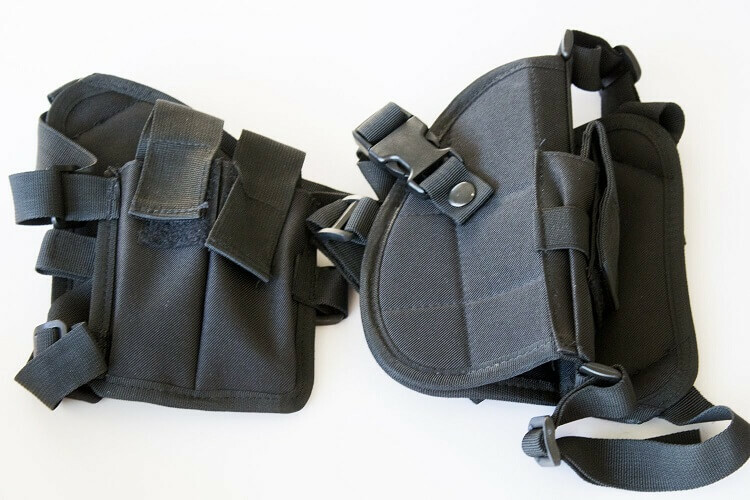 If you prefer a shoulder holster to a waist band, Under Control Tactical is a prime choice. Constructed of extra-rugged nylon, the holster is extremely strong and durable. It is also compatible with practically every hand gun you can think of, from Glock to Colt to Springfield. This holster is lightweight, water resistant, and adjustable to the point of military precision. It also comes with a pouch for a magazine and another one for a flashlight. The movable components of the straps are impact resistant, and the buckle releases quick and smooth. A snap instead of Velcro is used over the gun, which makes for quieter draws. But you also have to push down a clamp to release the gun, which takes an extra moment of time. It can take a little while to figure out how to properly adjust the straps, and no instructions come with the product. However, most are able to figure it out pretty quickly. The asking price is around $30. 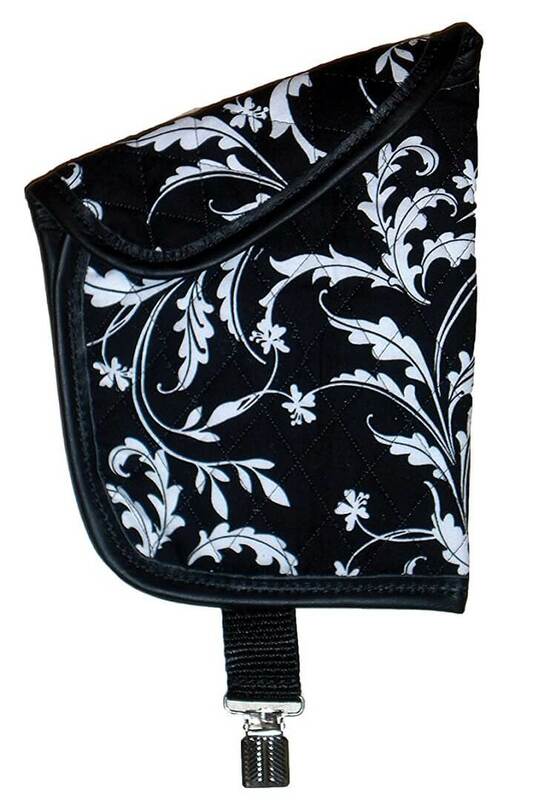 Another option for gun holsters for women is to use an in-purse holster like this one put out by Gals With Guns. So long as your purse is large enough to contain it, it is extremely discreet. Keep your purse contents organized and memorize the position of the holster, and you can access and draw your hand gun rapidly. This holster sports fashionable colors, a soft, quilted fabric, and stylish leather trim. A magnet holds the snap closed but gives way easily when you need to pull the gun out. A clip holds the holster to the purse so it won’t come out with the gun when you draw. So far as we have been able to determine, this holster currently only comes with right-hand draw. The price is around $25. Gun holsters for women also come as bra holsters. Daltech Force is one of the best in this class. 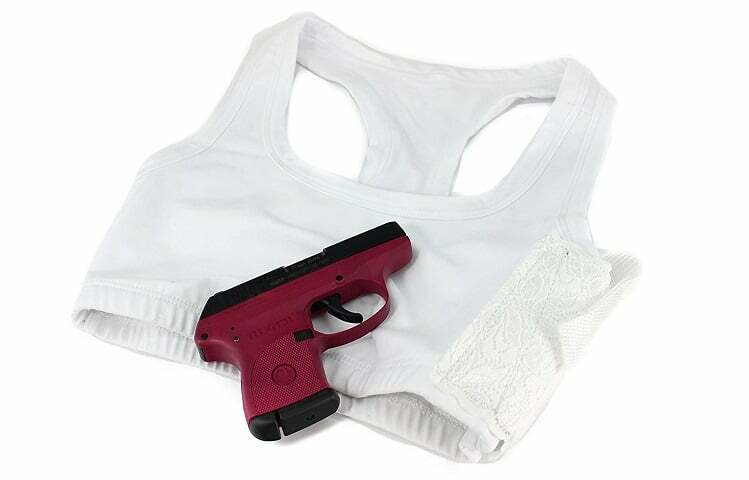 Its sports bra gun holster works best only with smaller hand guns. The material is lace and elastic, and the durability is “military grade.” You truly will get a great combination of comfort and toughness with this holster. It is very lightweight and conceals the gun almost perfectly. The one complaint many customer have had is in regard to sizing. Often, it is found that you need the next size up than what you normally wear with an ordinary bra. The price is right around $30. There are many options of gun holsters for women. You will need to balance comfort with security and be sure to choose only a holster with durable construction. Whether you prefer a waistline, shoulder-strap, in-purse, or bra holster will also be a huge factor when shopping for gun holsters for women. 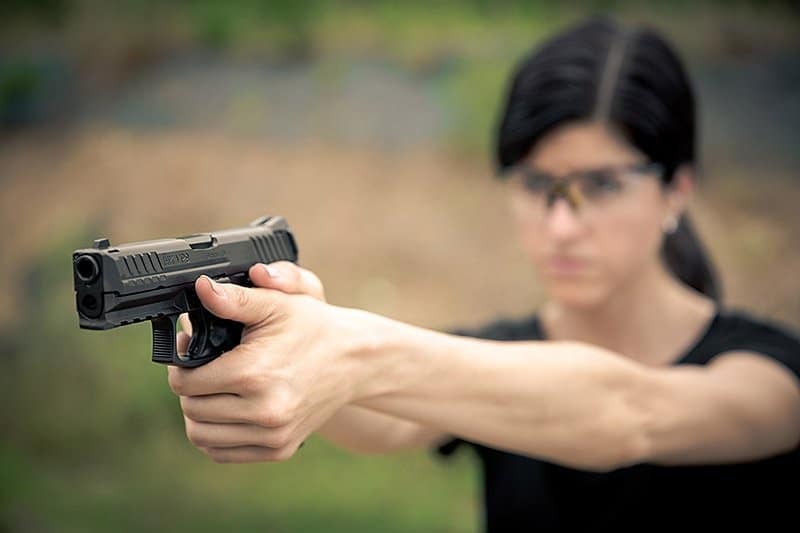 Hey Buddy!, I found this information for you: "Top 5 Discreet Gun Holsters for Women". Here is the website link: https://thegunrights.com/gun-holsters-for-women/. Thank you.